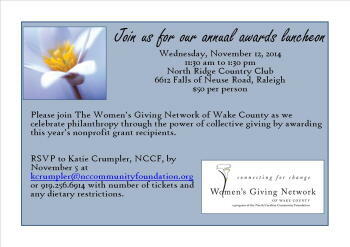 Thanks to the Women’s Giving Network of Wake County Members and Friends for attending the annual awards luncheon! We celebrated philanthropy through the power of collective giving by awarding this year’s nonprofit grant recipients. This served as a great opportunity to invite friends to see the role the Women's Giving Network plays in changing lives across Wake County.